Syria-Bound Russian Defense Military Plane Crashes After Departing Sochi : The Two-Way The Russian Defense Ministry says the Syria-bound aircraft dropped off radar early Sunday, soon after taking off from Sochi. There's no indication of any survivors, and the cause remains unknown. A search and rescue team attends to the crash site of a Russian Defense Ministry plane after the Tupolev Tu-154, with 92 people on board, fell off of radar over the Black Sea early Sunday. 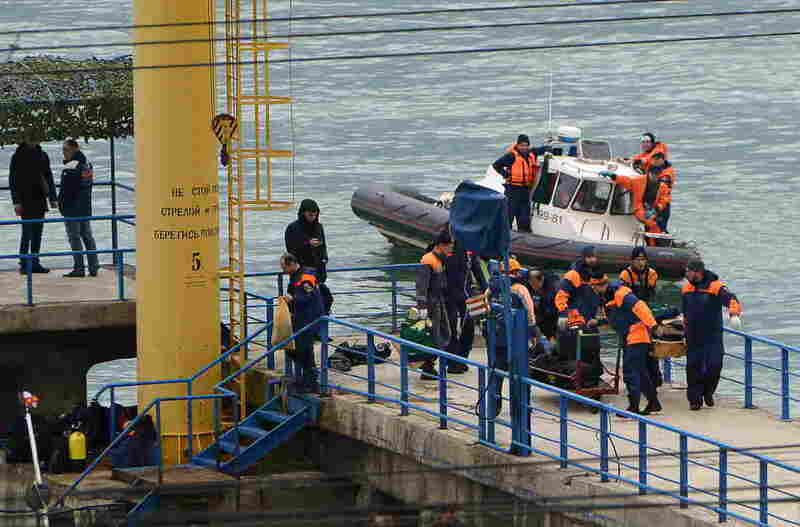 A Russian military plane carrying 92 passengers has crashed into the Black Sea, according to local media, citing the Russian Defense Ministry. The ministry says 84 passengers and 8 crew members were on board, reports the Associated Press, and that emergency teams have been dispatched. Russian state TV reports the Tu-154 passenger plane dropped off from radar about 20 minutes after taking off from Sochi's Adler airport at 5:20 a.m. local time on Sunday. The Defense Ministry says wreckage debris has been found about a mile off the Sochi coast. So far, rescuers have found one body and personal documents belonging to some of the passengers. As NPR's Lucian Kim tells our newscast from Moscow, the plane was reportedly carrying members of a military choir, the famed Alexandrov Ensemble, who were to perform in a holiday concert for Russian service members deployed in Syria. Defense Ministry spokesperson Igor Konashenkov said soldiers and nine reporters were also on board the plane, notes the BBC. A respected Russian charity doctor, Yelizaveta Glinka, was among the passengers, says the AP. "Glinka, known as Doctor Liza in Russia, has won broad acclaim for charity work that included missions to the war zone in eastern Ukraine. "Her foundation, Spravedlivaya Pomoshch, or Just Help, says she was accompanying a shipment of medicines for a hospital in Syria." There's no indication of any known survivors. The cause of the crash remains unknown, but Russian officials dismiss terrorism on the basis that the plane is military-operated. Viktor Ozerov, head of the defense affairs committee at the upper house of Russian parliament, said, "I totally exclude" the notion of an attack leading to the crash, reports the AP, citing his remarks carried by state RIA Novosti news agency. Lucian adds that Russian commercial airlines have been gradually phasing out the Soviet-designed three-engine aircraft for more modern models, but, as the AP notes, the military has continued to use them.